The Bahá’i faith was founded in the 19th century by prophet Bahá’u’lláh in Iran. It focuses on the characteristics of unity, inclusion, equality and service. It now has over 6 million devotees all over the world. 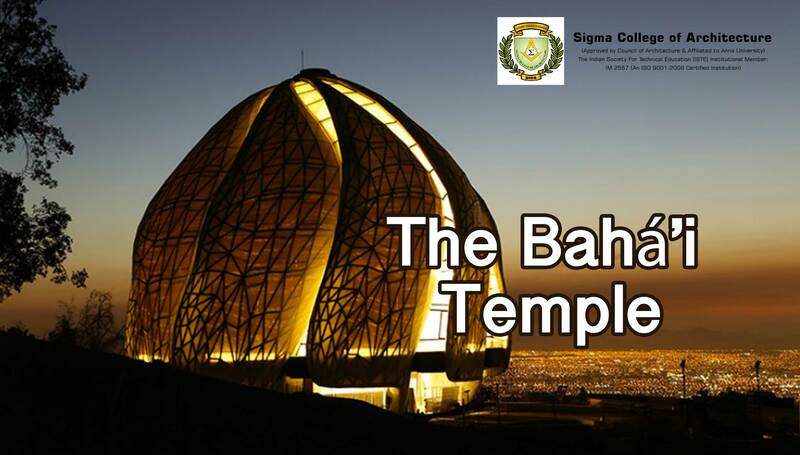 In 2003 a new Bahá’i Temple was announced to be constructed in Santiago, Chile South America. Among the 185 submissions the one to be accepted was a Toronto-based firm, Hariri Pontarini Architects. Hariri spoke about the ordeals during the 13 year long construction of the temple “It was like designing one of the first churches for Christianity, or one of the first mosques for Islam. It couldn’t just look like a Mosque, Synagogue, Cathedral, Opera hall or Art gallery”. The temple has 9 entrances and it opens up to the sun. The central prayer area has no deities or special place for worship. It can house 600 faithful’s. The temple was designed the Temple so that visitors encounter it gradually, ascending a long stairway (or ramp) before they reach a terrace with a reflecting pool. Here at Sigma College of Architecture, one of the Top Architectural Colleges in Tamil Nadu we help our students broaden their horizons by educating them on projects that even creates a place of worship without following any traditional norms.